During the early days of November, it certainly seemed like we were on track to reverse a significant portion of October’s equity market losses. This belief, however, was short lived as we entered a period of daily ups and downs in the market with no clear trends to guide market participants, although the month ended with a more positive tone, much like the end of October. Economic data continued to reveal divergences across the globe with North America still displaying solid economic growth, while Europe and Japan continued to experience significantly weaker growth and, in some cases, outright declines. While Canada and the U.S. remain on solid footing, the impact of rising interest rates certainly began to show up in the interest-rate sensitive sectors such as housing, and may also be dampening inflationary pressures as inflation remains relatively benign. To be fair, a number of other factors are certainly keeping inflation under wraps despite the continued pressure on wages and reported labour shortages. These factors include the sharp drop in oil prices, the ongoing strength in the USD which is dampening US import prices, and strong profit margins which companies may be tapping into as a buffer against higher input prices. As widely expected, the Fed left the fed funds rate unchanged at 2.00-2.25% in early November with the Fed’s statement largely unchanged from September. Market participants continue to expect the Fed to increase interest rates in December although there is some debate as to whether the economic data continues to support the previously anticipated interest rate hikes for 2019 as reinforced by Chairman Powell’s late November speech where he said that interest rates sit “just below” the range of estimates for the neutral level. In Canada, economic data released since the Bank of Canada’s late October meeting suggests the Bank may hold off on raising rates in December. Government bond yields across the maturity spectrum in both Canada and the U.S. declined by at least 10 bps over the month, suggesting the market is becoming less concerned about inflationary pressures and the risk of an overheating economy. The decline in interest rates was a boon for investors holding government bonds, but holders of corporate bonds did not fare as well. Corporate credit spreads widened in November, with Canadian corporate and U.S. high yield bonds bearing the brunt of the action. For the month, the FTSE Canada Overall Universe (broad Canadian bond market) returned 1.0%, while the FTSE Canada Corporate Universe returned a smaller 0.4%. Equity markets were certainly in see-saw mode throughout November as they reacted to every corporate and economic news item with no evidence of a clear trend. Politics and trade-related comments from world leaders dominated much of the action, but corporate earnings releases were also closely monitored and triggered more intense reactions from market participants than in the recent past, as valuation multiples are no longer providing support to the slightest revenue or earnings miss. In local currency terms, emerging markets were the big winner as they benefited from the significant drop in energy prices. The U.S. market also recovered about a quarter of October’s losses with much of the gains occurring during the last week of the month. Compared to their counterparts south of the border, Canadian investors benefitted even more from foreign exposure in November as the CAD fell another 1.2% against the USD. 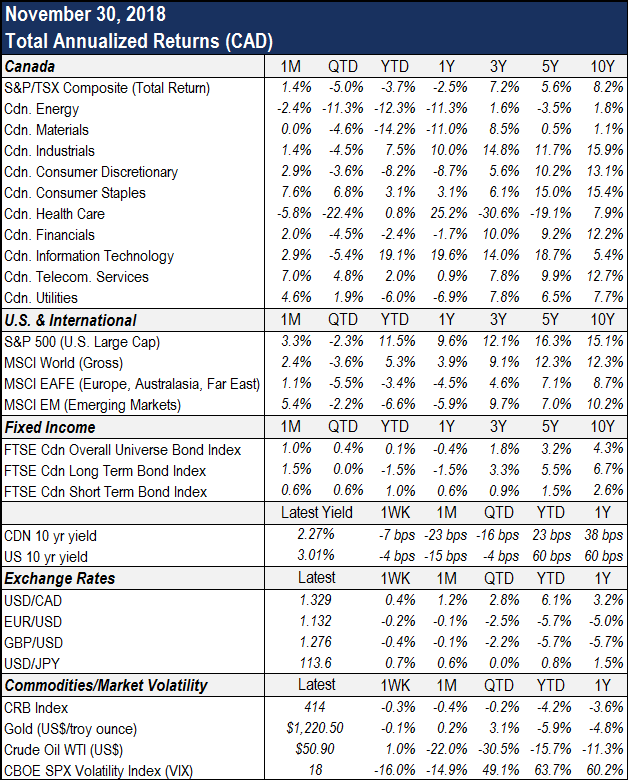 Overall, the Canadian equity market returned 1.4%, the U.S. equity market (S&P 500) returned 3.3%, the non-North American developed equity market (MSCI EAFE) was up 1.1% and emerging markets rose a whopping 5.4%. One of the most closely followed stories in November was the continued decline in oil prices. Not only was there downward pressure on the price of WTI (down 22%), but the price of Canadian crude relative to WTI showed no signs of improvement due to the continued constraints on getting oil to market. While a boon for energy consumers in Canada and globally, pipeline capacity constraints are significantly hindering both Alberta’s economy, as well as Canadian energy producers. It remains to be seen how this will impact Canada’s economy overall.